This was the second recipe that I ever made on this blog, over 4 years ago. It continues to be one of my favorite Chris Kimball recipe of all time. The recipe as I’ve listed below is portioned slightly different from Chris Kimball’s original recipe; this version yields 6 cutlets rather than 8. I make it every few weeks, because it is so easy and perfect for a mid-week meal; it is ready in about 45 minutes with minimal effort. My kids love it and the pay off is immense. The only thing that can go wrong with the recipe is you don’t reduce the wine sufficiently in Step 11. Otherwise a fool-proof 5-stars. I sometimes make Saltimboca when visiting friends and relatives, and noticed that many supermarkets only sell pre-packaged prosciutto. The pre-packaged stuff is always domestic, and I prefer Prosciutto de Parma available only at deli counter. Ask them to cut it thick enough for the slices to hold together. It they are cut too thinly sliced, or shaved, you risk losing the prosciutto when you flip the chicken. On the other extreme, thick slices won’t stick to the chicken. If you get the thin end of the prosciutto, then you’ll need 6 slices. The only thing that can go wrong with this recipe is that you don’t reduce the sauce properly in step 11. If you don’t concentrate the wine sufficiently, the sauce will not be intense. Also be careful not to burn the sauce, it goes quickly from 1/4-cup down to burned goo. Start time 5:30pm. Dinner time 6:30pm. Trim away any ragged edges as necessary, and cut away the pointy tips trimming back 1 inch to form a rounded cutlet. Lay chicken flat on cutting board and put in freezer for 15 minutes. Meanwhile, put flour in a shallow dish or plate. Lay your hand flat on top of chicken, and with knife flat (parallel to cutting board) slice each breast to form two thinner cutlets. Sprinkle chicken with salt and pepper. Cut each slice of prosciutto in half to form 6 pieces. I like to cut it at a bit of an angle to approximate the shape of the chicken cutlets. Adjust oven rack to middle position and heat oven to 200°. Heat 1 tablespoons olive oil in 12″ skillet (regular, not non-stick) over medium-high burner until begins to shimmer; about 4 minutes. Add 3 cutlets to skillet with the prosciutto-side down. Cook for 4 minutes until golden brown. Transfer to wire rack set on rimmed baking sheet and keep warm in oven. Repeat with another 1 tablespoons olive oil and remaining 3 cutlets, then put in oven to keep warm while preparing sauce. Pour off any excess fat from skillet. Turn up heat to high and add vermouth/wine. Use metal spatula to scrape up any browned bits, and allow to reduced for 7 minutes to about 1/4 cup. Add lemon juice and whisk in butter, a tablespoon at a time. Off heat, stir in parsley and season with salt and pepper. Remove chicken from oven and place on platter. Spoon sauce over cutlets before serving. Yesterday was the best grilling day so far in 2014, so I took advantage by making a simple, grilled, herb chicken. The recipe uses common bricks, wrapped in foil, to ensure that the skin will brown evenly and completely rendered. The skin was delicious, but tore away in spots because I didn’t loosen it using a metal spatula in step 11. I originally made this recipe about 4 years ago, but again somewhat under-estimated the time required to make the recipe. Because I used a 5-lb chicken (the recipe is timed for a 4-lb chicken), I added 5-minutes to each of the grilling times given in the instructions. The chicken was perfectly cooked and flavorful. Just be sure that you start early enough in the afternoon, allocating 4 hours for a 5-pound chicken. 4-stars. 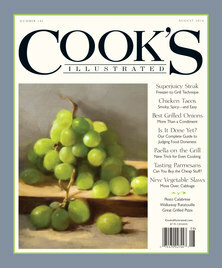 Chris Kimball says that you can use a cast iron skillet in lieu of bricks, but I recommend bricks for each of clean-up. Be sure to use a thermometer to ensure that the chicken is fully cooked. The timings were off by more than 20 minutes, based upon the size of my chicken. In a small saucepan, add olive oil, lemon zest, and pepper flakes. Peel garlic and press the 8 cloves directly into oil. Place saucepan over medium-low burner and bring up to a simmer; about 3 minutes. Meanwhile chop thyme and rosemary, and when oil begins to simmer add 3 teaspoons thyme and 2 teaspoons rosemary and cook for 30 seconds more (reserving 1 teaspoon of each herb for sauce in step 13). Set a fine mesh strainer over a small bowl and strain oil, pressing on solids to extract as much oil as possible (for use in sauce in step 13). Empty solids into another small bowl (to apply onto chicken in step 5), and set aside both bowls. Butterfly the chicken by cutting through bones on both sides of backbone (with kitchen shears); either discard backbone or save for making homemade chicken stock. Flip chicken over and use the heel of your hand to flatten the breasts; tuck the wings behind the back. Use your fingers to loosen the skin over the breasts, thighs and drumsticks. Trim away any excess fat to prevent flareups. In a small bowl combine 1 tablespoon kosher salt ( or 1-1/2 teaspoons table salt) and 1 teaspoon pepper. Mix 1 tablespoon salt/pepper mixture (or or 1-1/2 teaspoons if using table salt) with cooled garlic solids. Use your fingers to evenly spread the salt/garlic mixture under skin on the breast, thighs, drumsticks. Flip chicken and sprinkle remaining salt/pepper on the meat on the boney side of the chicken. Set a wire rack in foil-lined, rimmed baking sheet. Put chicken skin-side up and refrigerate, uncovered, for 1 to 2 hours. With about 20 minutes remaining, light a 3/4-filled chimney starter filled with charcoal and allow 20-minutes to ignite. Meanwhile wrap 2 bricks with aluminum foil. After coals become mostly covered in fine grey ash, evenly spread all coals over half the grill, leaving the other half empty. Set the cooking grate and position the wrapped bricks directly over coals. Cover and pre-heat for 5 minutes. Clean the cooking grate (using dish towels to handle the hot bricks); scrape grill and wipe with a wad of vegetable-oil dipped paper towels. You should only be able to hold your hand 5″ above grill grate for 3 to 4 seconds. 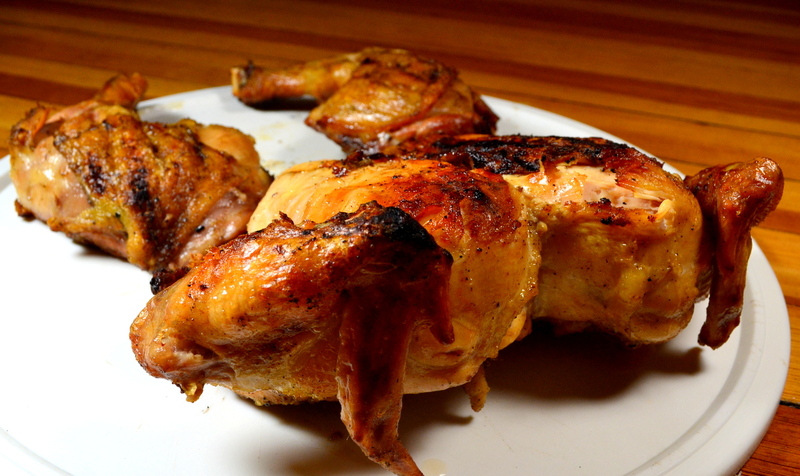 Set chicken with skin-side down over the cool side of the grill with the legs facing towards the fire. Using dish towels to handle the hot bricks put them lengthwise over each breast. Cover and cook for 25 minutes; until you see faint grill marks. Use a metal spatula to carefully ensure that the chicken hasn’t stuck to the grill. Use tongs and a kitchen towel, gripping legs, a flip chicken. Position with skin-side up directly over the coals with the breasts towards the center of the grill. Replace bricks over breasts, cover grill, and continue cooking for 12 to 15 minutes until the chicken becomes well-browned. Remove bricks (you won’t use them anymore) and flip chicken skin-side down to crisp the skin over the hot coals. Continue cooking for at least 5 to 10 minutes, moving chicken around to cook evenly and to prevent flare-ups. When the internal temperature of the chicken reaches the proper temperature (165-degrees for chicken breasts and 175-degrees for thighs and drumstick), move to a cutting board and allow to rest, uncovered for 10 minutes. Meanwhile, add lemon juice into oil reserved from step 1. Add remaining thyme and rosemary, and adjust salt and pepper according to your taste. 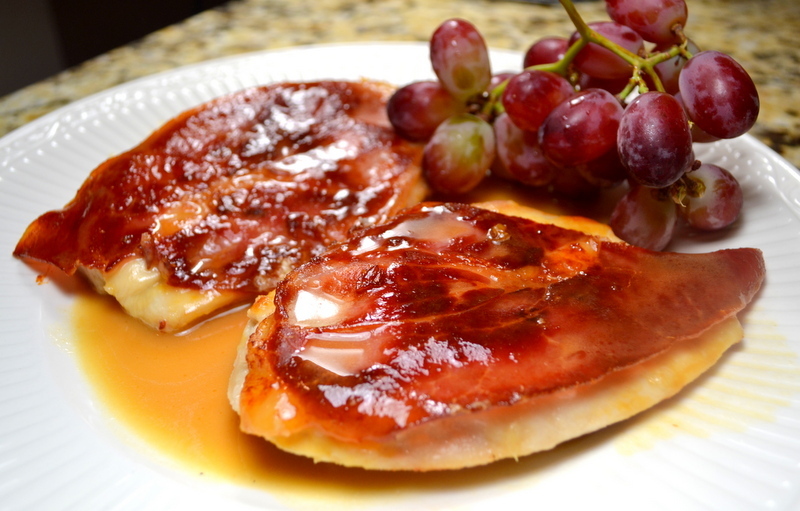 Carve chicken and serve, passing the sauce separately. I love to bake bread. It warms up my kitchen and the fills my house with delicious aromas, improving everyone’s mood. While my kids prefer a spoonful of sugar in their sandwich bread, I often want an adult-friendly loaf. While the best way to achieve my desired results is to make a biga or starter the night before; the fermentation gives great depth and complexity of flavor; today’s recipe is for those instances when I just need to make a quick loaf of sandwich bread. It’s fool-proof and ready in about 2 hours with a total of about 15 minutes of work. I use 6-ounces of beer to make up for the flavor lost by skipping the 12 hours required to make the biga. 4-1/2 stars. 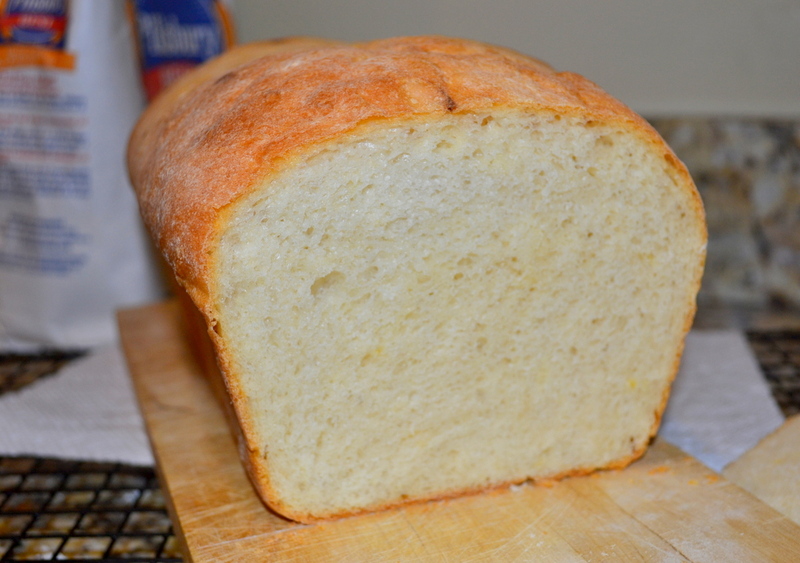 When I make this loaf for my kids, I use 4-ounces of water instead of beer, 10-ounces of milk instead of 8-ounces. I also add 1-1/2 tablespoons sugar or honey (added to wet ingredients while hydrating yeast). Overall I’ve been making my kids homemade sandwich bread for a about 4 years and perfected this large 12-hour sandwich loaf. I also make a small 12-hour version here. Of course, bread made without any preservatives goes stale relatively fast. I make this bread sans preservatives and is still good after 3 days. If you want it to last all week; e.g. to bake this bread on Sunday and have it stay fresh through Friday’s lunch. I found a list of natural preservatives that can use in sandwich bread. I sometimes use granulated lecithin (which I bought online). The keys to making bread without preservatives are: (1) Do not overcook. Bake only until the loaf reaches an internal temperature of 200-to-205-degrees. (2) Allow loaf to fully cool prior to slicing, or you will allow moisture to escape and give your loaf a head-start on becoming stale. 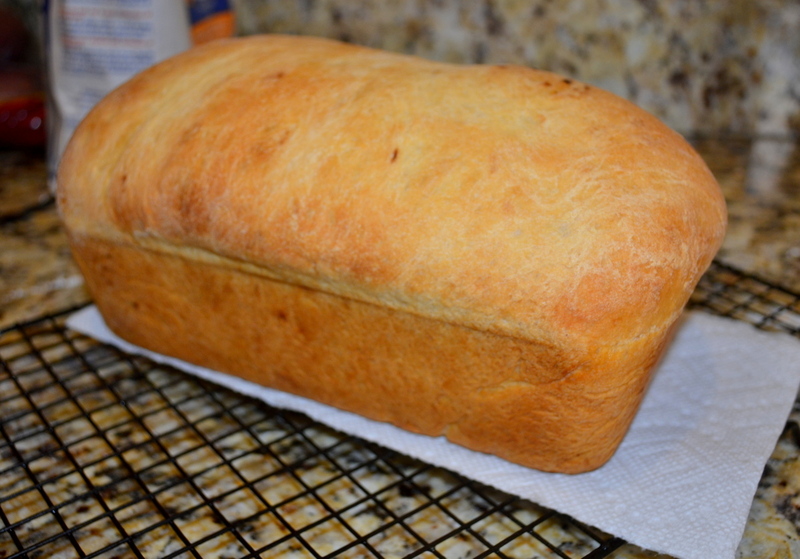 (3) Use some olive oil to keep the loaf from being too dry. Do not cut your loaf before it has cooled to room temperature. In the past I had tried slicing my bread after 1 hour, placed the slices in large plastic bread bag and immediately saw condensation. 2 hours are minimum, but I recommend 3 hours of cooling time. Starting to bake the loaf at higher temperatures during the first 7 minutes (in Step 8) gives great “oven spring” so you don’t get a dense loaf. But reducing the temperature will also ensure that the crust doesn’t get too dark by the time the loaf reached an internal temperature of 200-to-205-degrees. The use of milk in this recipe keeps the final crumb relatively tight. Use 1 tablespoon in step 2, then cut down rising time to 1 hour. Pre-heat oven to 200-degrees, and immediately turn off once it reaches the desired temperature. You will use the residual heat to cut the rising time down to 45 minutes. Add milk and beer/water to a Pyrex measuring cup (at least 2 cup capacity); heat in microwave for 1m15s mixture until it reaches about 105-degrees. Whisk in yeast; allowing it to hydrate for 5 minutes. Add in olive oil and stir to combine. Whisk together flour and salt in large bowl. Add yeast mixtures from step 1. Use a rubber spatula to fold until shaggy ball forms, scraping up dry flour from bottom of bowl. Kneed dough for 2 minutes. Spray bowl with non-spick cooking spray, put dough in bowl, cover with plastic wrap and place in warm, but turned off, oven for 40 to 45 minutes. The dough should double in size. Spray your loaf pan with non-stick cooking spray. Gently turn the dough out onto a very lightly-floured work surface. Gently press the dough into a rectangle so that it corresponds to the length of your loaf pan. Spray dough with water and roll up into a tight log. Move dough into pan and softly press so that it touches all four sides of the pan. Spray top with dough with non-stick cooking spray to prevent the dough from deflating in Step 8. Cover loosely with plastic wrap (realizing that the loaf will grow above the top of the pan). Place it in a warm spot in your kitchen for about 45 minutes; until the dough has doubled in size and does not readily spring back when you poke it with your finger. About 20 minutes prior to baking, begin pre-heating your oven to 425-degrees. Adjust an oven rack to middle position; any lower and your bottom crust will be too hard. Carefully remove plastic wrap, spray the loaf three times with water from a spray bottle, (optionally sprinkle top with a little bit of flour). Carefully place loaf pan in 425-degree oven. Set kitchen timer for 28 minutes corresponding to the total cooking time. After 7 minutes, reduce oven temperature to 375-degrees and turn loaf 180-degrees. Bake uncovered for 8 additional minutes. Tent with aluminum foil to keep the loaf top soft; baking for remaining 13 to 15 minutes. An instant-read thermometer inserted into the center of the loaf will reads 200-degrees when the loaf is done. Carefully remove bread from pan, and let cool on a wire rack for 2 to 3 hour before slicing. You are currently browsing the My Year Cooking with Chris Kimball blog archives for April, 2014.